One of the things that my children may not experience while living in the United States is seeing and hearing a street hawker peddle his wares. I think the closest street hawking experience that they will encounter is with an ice cream truck playing toddler music in a neighborhood park. My room in the house I grew up in Manila fronts a relatively quiet street. I hear everything that passes by from buyers of old newspapers and bottles calling out dyaryo, bote, to a man on a bike offering to sharpen knives hollering has-a, to young and old entrepreneurs selling balut (duck eggs) and taho (sweet tofu). My all time favorite is taho. The dialogue between the peddler and customer is quite unique. The peddler walking down the street shouts in a deep baritone voice, taho-o-o-o-o. The prospective customer who is indoors shouts back at a slightly higher pitch, taho-o-o-o-o. The last syllable is a bit higher in pitch almost sounding like a question. At this time, the peddler tries to look for the person who just echoed what he said. If the peddler can’t see who is trying to get his attention, he will stop and repeat his call. The customer then repeats his response while trying to run out in the open to establish eye contact. It is a very interesting process to say the least! My children had lots of questions when I tried to explain the whole process of buying taho in the street. I can’t have my taho from our suki in Melchor Street, but I can get a whole tub for $1.89 in an Asian grocery store. I can also make my own taho from soymilk nuked in the microwave for about 7 minutes (depending on the amount). It will have a custard consistency which I am not a fan of that’s why I seldom do it. If your Asian store does not carry taho, then nuking soymilk is your best bet. I like my taho warm with lots and lots of sago (tapioca balls) and just a hint of simple syrup made with brown sugar. I make my own sago, so I make it chewy and not so sweet. Both my children can’t get enough of this. We usually have it for snack when we get home from school, but we have eaten it for breakfast too. Measure a cup of soymilk and put in a deep bowl or a tall glass. During the heating process, the soymilk may overflow so choose a deep bowl. Microwave for 5 minutes and check consistency. If still runny, continue to cook checking every minute. Cooked taho would be about 1/2 cup. In a pot of briskly boiling water (approx 6 cups), add 2 cups tapioca balls. Reduce heat to medium and cook for 2 1/2 hours. Add brown sugar and cook for another 30 minutes. I only use 1/2 cup of brown sugar but you can add more. 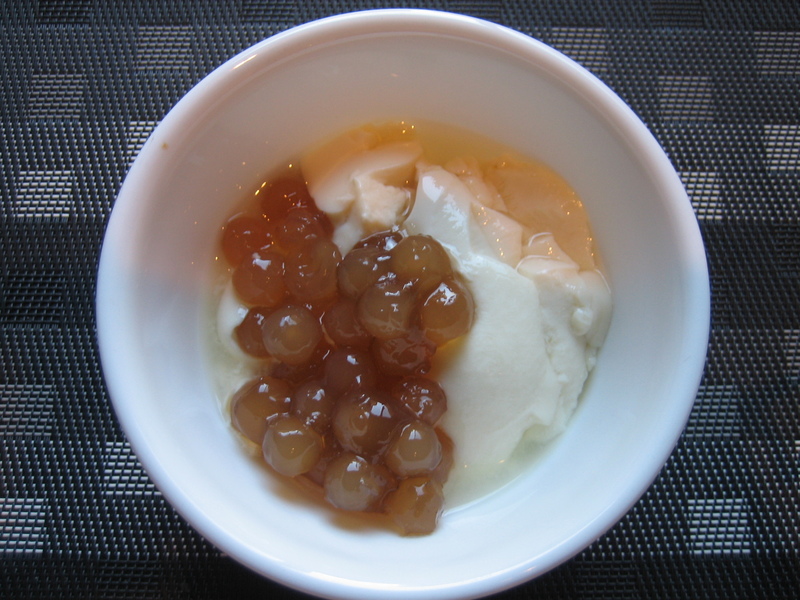 Posted in Filipino Recipe and tagged asian grocery store, food, sago, simple syrup, street hawker, sweet tofu, taho, tapioca balls. Bookmark the permalink.